8-player, single-round all-play-all, with draws not counting and replayed. La Grande Storia degli Scacchi, Feenstra Kuiper in Hundert Jahre Schachturniere, and Forster give only the official scores, omitting the draws. Sergeant, Feenstra Kuiper in Hundert Jahre Schachzweikämpfe, Gaige and Di Felice all indicate that Zukertort had draws with both Steinitz and de Vere. Sergeant says explicitly that these were the only two draws. However, the Chess Player's Chronicle of Aug. 1872 (p.121) shows draws for Blackburne, Martin, Steinitz and Zukertort, and shows a score for all 7 games for Zukertort (+4-3=1), suggesting that Zukertort had only one draw, but the Westminster Papers of 1 July 1872 (p.34), reporting on results up to 27 June, says explicitly that Blackburne drew with Martin and Zukertort drew with de Vere. So either Sergeant was incorrect to say that there were only 2 draws in this event, or there was no draw between Steinitz and Zukertort. A drawn game between these two players appears on p.55 of the Westminster Papers (1 Aug. 1872), but it is not stated to have been part of the British Chess Association Grand Tourney. It is not one of their match games, so might have been either part of the Grand Tourney or the Handicap Tourney or an offhand game. Sergeant says that they had 2 draws in the Handicap Tourney, so it seems most likely that Sergeant's crosstable, showing a draw Zukertort-Steinitz was an error for a draw Zukertort-de Vere, and that Feenstra Kuiper, Gaige and Di Felice simply copied Sergeant's error. The drawn game Zukertort-de Vere is actually given in the Deutsche Schachzeitung of Sept. 1872 (pp.249-250). The table of results in the Chess Player's Chronicle (Aug. 1872, p.121) shows only 6 decisive games for Blackburne and de Vere, and 5 for MacDonnell ('Hiber') and gives no score at all for Gossip, saying only '(resigned)'. This would appear to indicate that MacDonnell had yet to play Blackburne and de Vere at the time the report was written. 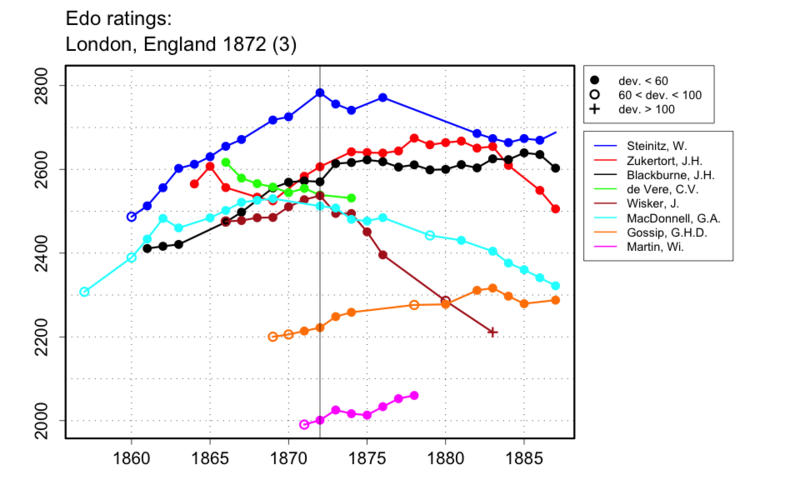 This is consistent with the crosstable appearing in the 1 Aug. 1872 issue of the Westminster Papers (p.49). Presumably MacDonnell ended up losing both of those games, as the Westminster Papers of 1 Sept. 1872 (p.65) says that Zukertort, MacDonnell and de Vere eventually tied for third. How many games Gossip played before withdrawing is not clear, so some of his losses were presumably by default. Zukertort's win over Gossip, played on 24 June 1872, is given in the Westminster Papers (1 July 1872, pp.38-39). According to Tim Harding, from Land and Water and other sources, Gossip's games against Martin, Zukertort, de Vere, and probably Blackburne were actually played. The others are less clear, but without further evidence I don't include them here. The report in the Morning Post of 22 July 1872 (p.2) is garbled, and the same report, uncorrected appears in the Era of 28 July 1872 (p.7). Neither Feenstra Kuiper, Gaige nor Di Felice give the tie-break matches, but Sergeant says that Zukertort beat MacDonnell and MacDonnell beat de Vere, who defaulted to Zukertort. The Westminster Papers of 1 Sept. 1872 (p.65) only says that de Vere 'resigned' and Zukertort won third prize. I am presuming that these play-offs were single game matches for each pairing. Di Felice gives dates for the event of 2-14 July, 1872, but La Grande Storia degli Scacchi gives June/July 1872. The Chess Player's Chronicle of June 1872 (p.88), and of Aug. 1872 (p.120), the Westminster Papers of 1 July 1872 (p.34) and the Morning Post of 22 July 1872 (p.2) say that play began on 24 June 1872. Staunton in the Illustrated London News of Aug. 17 says that the Grand Tourney was still not finished, though Steinitz had already won. The final account in the 1 Sept. 1872 issue of the Westminster Papers indicates that the play-offs were finished sometime in August. Di Felice calls this the '2nd British Chess Federation Congress'.